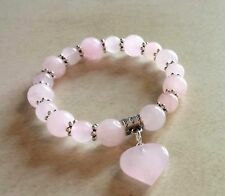 And have added a stunning Rose Quartz puffy love heart charm. Semi Precious Rose Quartz beaded bracelet. Designed with stunning Rose Quartz 8mm Gemstone beads. Here we have a gorgeous unique hand crafted Natural bead bracelet. 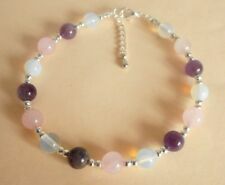 Rose Quartz & Hematite Silver bead bracelet. bail hanger, with Tiny Black Hematite Cube beads in between each Bead. Encased one Rose Quartz bead in stunning Silver Plated Love Heart. 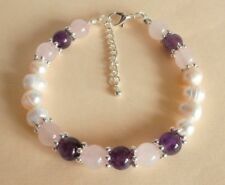 Designed using stunning Rose Quartz gemstone beads and I have. Focus on the healing properties and wear regularly to feel the benefits. HOW IT WORKS?. The healing properties of gemstones are based on positive thinking and beliefs. Elasticated to fit. healing heart charm. 18 mm rose quartz heart charm. 8 & 10mm rose quartz beads., deep inner healing and feelings of peace. Rose Quartz. It hastens recovery, reduces high blood pressure, aids chest and lung problems. HOW IT WORKS?. The healing properties of gemstones are based on positive thinking and beliefs. Healing properties; Hot Flushes; Night Sweats; Palpitations; Mood Swings; Headaches; Joint Pain; Insomnia; Fatigue; Weight Gain; Bloating; Hormonal Cycles; Skin Complexion; Feminine Energy; Sexual Desire; Self Esteem; Anxiety and Emotional Soothing. Anklet width 8mm; Anklet length; 23cm plus 2.5cm extension chain. HOW IT WORKS?. The healing properties of gemstones are based on positive thinking and beliefs. Healing properties; Hot Flushes; Night Sweats; Palpitations; Mood Swings; Headaches; Joint Pain; Insomnia; Fatigue; Weight Gain; Bloating; Hormonal Cycles; Skin Complexion; Feminine Energy; Sexual Desire; Self Esteem; Anxiety and Emotional Soothing. Rose Quartz ( stone of self esteem & love ) & black lava beads with sparkly clear rhinestone spacers & 2 Tibetan heart charms. Bracelet is 7" long a 2" extension chain & a lobster clasp fastener. Healing properties; Nausea; Vertigo; Dizziness; Balance; Headache; Palpitations; Perspiration; Abdominal Pain; Digestive System; Kidneys; Nervous System; Fatigue; Emotional Soothing; Wellbeing. HOW IT WORKS?. HOW IT WORKS?. The healing properties of gemstones are based on positive thinking and beliefs. Bracelet width 8mm; Bracelet length; 19cm plus 3cm extension chain;. Anklet width 8mm; Anklet length; 23cm plus 2.5cm extension chain. HOW IT WORKS?. The healing properties of gemstones are based on positive thinking and beliefs. Semi Precious Rose Quartz beaded bracelet. 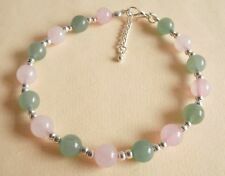 Designed with stunning Rose Quartz 8mm Gemstone beads. Here we have a gorgeous unique hand crafted Natural bead bracelet. At the end of this stunning bracelet are little wire guardians and. Focus on the healing properties and wear regularly to feel the benefits. HOW IT WORKS?. The healing properties of gemstones are based on positive thinking and beliefs. To prolong the life of your item handle with care. Tiny Black Hematite Cube beads in between each Heart t o create this. 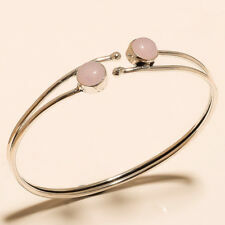 Designed using stunning Rose Quartz gemstone beads and I have. Here we have a gorgeous hand crafted bead bracelet. This beautiful bracelet is 7-3/4" but I take custom orders for different. Opalite is a subtle yet highly energetic stone. Opalite improves communication on all levels, especially the spiritual. Opalite is an all-round healing stone. Rose Quartz is the stone of universal love. Really pretty bracelet made from these lovely Lampwork Glass beads and Rose Quartz beads with Silver Plated spacers and clasp. It measures approximately 8 inches and it is also stretchy. Would make a beautiful gift. Please see photos and if you have any questions please ask. Healing properties; Nausea; Vertigo; Dizziness; Balance; Headache; Palpitations; Perspiration; Abdominal Pain; Digestive System; Kidneys; Nervous System; Fatigue; Emotional Soothing; Wellbeing. Anklet width 8mm; Anklet length; 23cm plus 2.5cm extension chain. 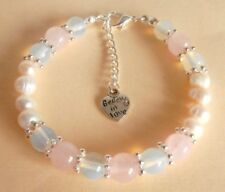 Strawberry & Rose Quartz Gemstones Beaded Bracelet, Stunning Perfect Gift !! Designed using stunning Strawberry Quartz 8mm Gemstone beads. Semi Precious Quartz beaded bracelet. and Rose Quartz 4mm Gemstone Beads in between each to create. Here we have a gorgeous unique hand crafted bead bracelet. 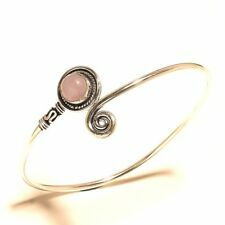 Handmade Silver plated copper wire bracelet with Natural Stone Rose Quartz 10mm beads. Semi Precious Frosted and Rose Quartz beaded bracelet. Designed with stunning Frosted Rose Quartz 8mm Gemstone beads. and Stunning 8mm Rose Quartz Beads and in between each it a tiny Silver. Silver plated open heart charm to create this Gorgeous Bracelet. HOW IT WORKS?. The healing properties of gemstones are based on positive thinking and beliefs. Bracelet width 8mm; Bracelet length; 19cm plus 3cm extension chain. Lovely handmade morse code bracelet for the clever spy in your life! The faceted blue goldstone beads spell out ‘love’ in morse code (big bead dash, little bead dot) with the final ‘e’ represented by a tibetan silver heart charm. HOW IT WORKS?. The healing properties of gemstones are based on positive thinking and beliefs. To prolong the life of your item handle with care. Semi Precious Frosted Quartz & Onyx beaded bracelet. Designed with stunning Frosted Rose Quartz 8mm Gemstone beads. and Stunning 6mm Black Onyx Beads and in between each it a tiny Silver. Here we have a gorgeous unique hand crafted Natural bead bracelet. Healing properties; Hormone Balance; Mood Swings; Pain relief; Water retention; Bloating; Food cravings; Fatigue; Insomnia; Hormonal cycles; Skin complexion; Feminine Energy; Stress relief; Anxiety; Anger and Emotional soothing. Simply roll on and roll off. Rose quartz is a stone of the heart. A healing gemstone, it carries an energy of compassion and peace, tenderness and healing. All the gemstones are unique and vary in colour, shape and size, making each one truly special and interesting to admire. Anklet width 8mm; Anklet length; 23cm plus 2.5cm extension chain. HOW IT WORKS?. The healing properties of gemstones are based on positive thinking and beliefs. To prolong the life of your item handle with care. 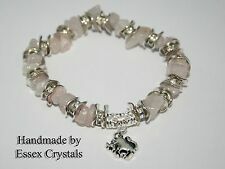 Rose Quartz & Purple Crystal & Elephant Bead Bracelet Charm Choice - Stunning!! Designed with stunning Frosted Rose Quartz 8mm Gemstone beads. Here we have a gorgeous unique hand crafted Natural bead bracelet. At the end of this stunning bracelet are little wire guardians and. Plated seamless Round Spacer bead used to create this Gorgeous Bracelet. 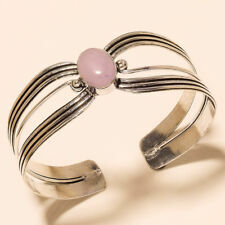 BANGLE WRIST WRAP BRACELET JEWELLERY. Known as the "Love Stone". It's a stone of unconditional love. It opens the heart chakra to all forms of love: self-love, family love, platonic love, and romantic love. 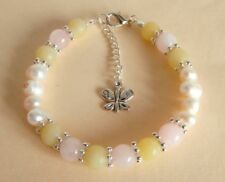 Rose Quartz Tube Beaded Stretchy Bracelet Mum, Auntie,Girlfriend - Nice Gift! Rose Quartz & Black Lava Rock Stunning Beaded Bracelet - Nice! Rose Quartz & Lava Rock bead bracelet. Designed using stunning semi precious Rose Quartz & Black Lava Rock. Here we have a gorgeous unique hand crafted bead bracelet. At the end of this stunning bracelet are little wire guardians and. Granny Rose Quartz & Sesame Jasper Beaded Bracelet- Mum, Auntie, Gran Nice Gift! Semi Precious Frosted Quartz & Labradorite beaded bracelet. Designed with stunning Frosted Rose Quartz 8mm Gemstone beads. and Stunning 8mm Grey Labradorite Beads and in between each it a tiny Silver. 8.5” 22cm Long Rose Quartz and Clear Crystal Bracelet Finished with a Toggle Clasp. The necklace is made up of 8mm (0.33”) Rose Quartz Beads and 4mm (6 to a 1”) Clear Crystal Beads. Threaded onto tiger tail bead wire for extra strength and finished with a Toggle Clasp.